The Super EZ Pool Lift is a modified version of our very popular EZ Lift to be used on above ground backyard swimming pools. The Super EZ Lift was specifically designed to clear walls 10 inches thick and up to 60 inches high making it perfect for your above ground backyard pool or spa. 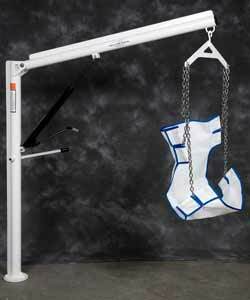 All stainless steel construction with the same durable powder coating provided on all Aqua Creek Products' lifts, the Super EZ was built for years of trouble free use. One year warranty on sling. I've left discontinued items online for those who want informaiton about them. People buying or selling these products used may find it helpful.